Investigating digital media is impossible without forensic tools. Dealing with complex forensic problems requires the use of dedicated tools, and even more importantly, the right strategies. In this book, you’ll learn strategies and methods to deal with information stored on smartphones and tablets and see how to put the right tools to work. We begin by helping you understand the concept of mobile devices as a source of valuable evidence. Throughout this book, you will explore strategies and "plays" and decide when to use each technique. We cover important techniques such as seizing techniques to shield the device, and acquisition techniques including physical acquisition (via a USB connection), logical acquisition via data backups, over-the-air acquisition. We also explore cloud analysis, evidence discovery and data analysis, tools for mobile forensics, and tools to help you discover and analyze evidence. 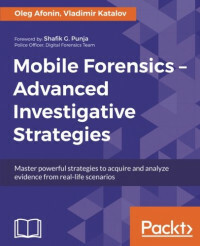 By the end of the book, you will have a better understanding of the tools and methods used to deal with the challenges of acquiring, preserving, and extracting evidence stored on smartphones, tablets, and the cloud. Oleg Afonin is a researcher and an expert in digital forensics. He is a frequent speaker at industry-known conferences such as CEIC, HTCIA, FT-Day, Techno Forensics, and others. Oleg has co-authored multiple publications on IT security and mobile forensics. With years of experience in the digital forensics and security domain, Oleg has led forensic training courses for law enforcement departments in multiple countries. Vladimir Katalov is CEO, co-founder, and co-owner of ElcomSoft Co. Ltd. Vladimir manages all technical research and product development in the company. He regularly presents at various events and regularly runs security and computer forensics training both for foreign and domestic (Russian) computer investigative committees and other law enforcement organizations.